The Gorilla Carts Rolling Garden Scooter allows you to get all your gardening chores done without pain and discomfort. 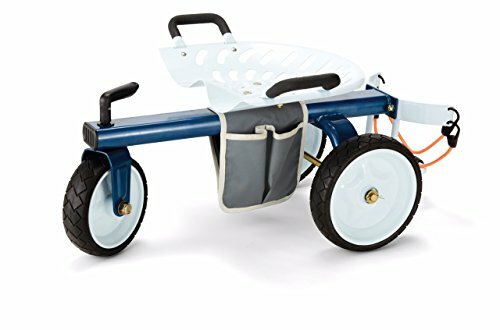 This rolling scooter has a swiveling seat that easily adjusts between 12" and 16" keeping you at the perfect height to comfortably complete any task. Innovative handles assist with effortless standing and sitting. The 3-wheel design and no-flat tires ensure great mobility at all times, so this cart is ready to go whenever you are. The scooter includes a tool organizer bag, as well as a bucket holder with bungee straps. Quick assembly and durable steel construction make this the ideal scooter for all gardeners. Gorilla Carts full line of products meets the needs of the light-duty homeowner as well as the commercial-duty professional user by offering carts in a wide variety of sizes and weight capacities.